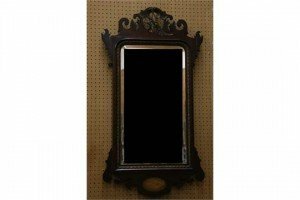 A pair of mahogany and panel gilt framed Georgian pier glass with ascendent phoenix, pierced frieze and shell inlay. 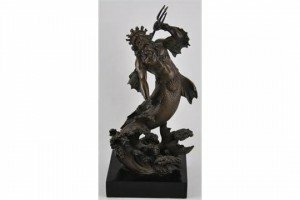 A dark patinated bronze of Neptune emerging from a wave on rectangular marble plinth. 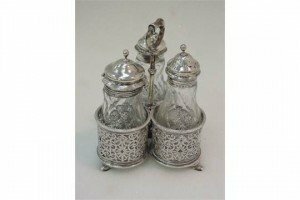 A Victorian silver cruet having three cut glass bottles within a silver holder having pierced decoration on trefoil bracket feet, London 1877. 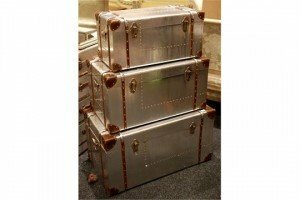 A set of three aluminium, graduated aviation chests with a leather and rivet trim. 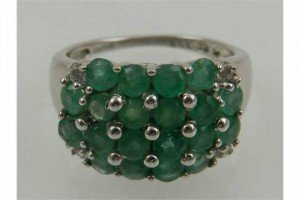 A 9 carat white gold, diamond, and emerald cluster ring, set twenty round cut emeralds, the corners set with four round cut diamonds. 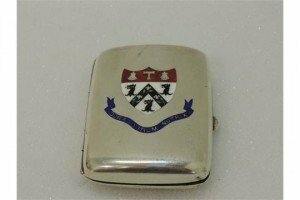 An Edwardian silver cigarette case bearing an enamelled armorial regarding Sedbergh Public School. 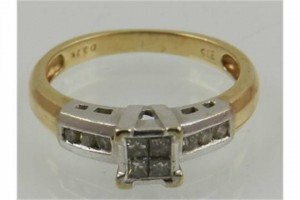 Chester 1901. 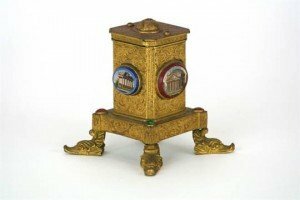 A Palais Royale gilt metal dispenser, engraved decoration, with four oval micro mosaics after the Antique, depicting the Pantheon and other ancient ruins. 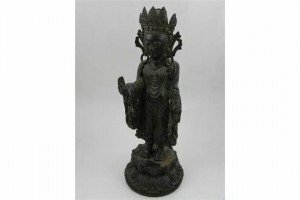 A bronze Hindu deity, seated on a stepped circular lotus throne, bears engraved leaf mark to base. 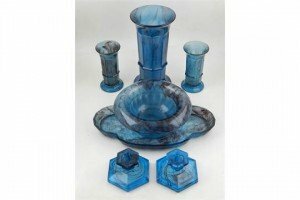 A quantity of 1930s cloud glass, by George Davidson, to include a vase, a smaller pair of posy vases, a pair of dwarf candlesticks, a circular bowl, and a glass tray. 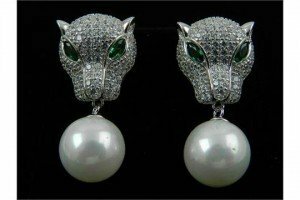 A pair of white metal, cubic zirconia, and faux pearl drop earrings designed as panthers. 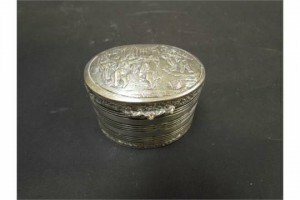 A 19th Century continental silver barrel form trinket pot with pictorial scene depicting musicians and dancers. 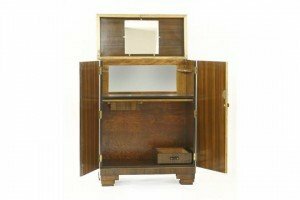 An Art Deco walnut and rosewood bar, the top hinged and opening to reveal a mirror, over shelves and a drawer, on stepped block feet. 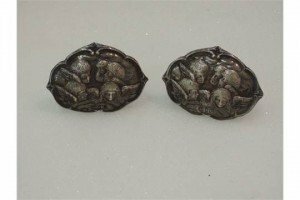 A pair of Victorian silver buckle fronts having repousse cherub decoration, London 1900. 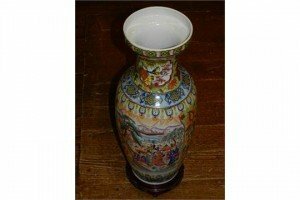 A 20th century Chinese porcelain vase, polychrome decorated with landscape scenes, figures and flowers, raised on circular hardwood base. 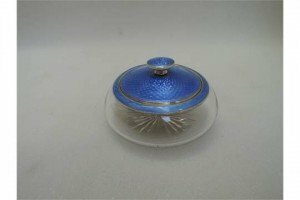 A glass dressing table pot having white metal and blue enamel guilloche collar and lid. 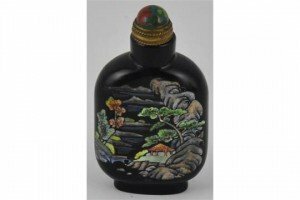 A Peking glass snuff bottle painted with pastoral scenes on a black background, bears a four character Qianlong style mark to base. 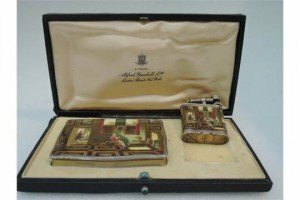 A cased silver Dunhill lighter and snuff box having pictorial and guilloche enamel decoration, with gilt interior, lighter hallmarked London 1928. 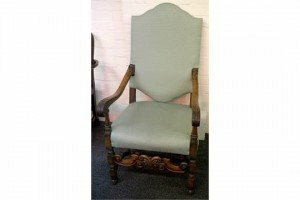 A continental late 19th century armchair, walnut frame, acanthus carving to scroll arms, turned supports, stretchers and legs. 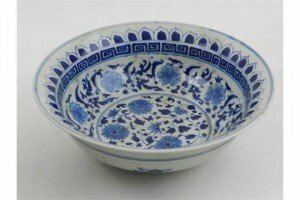 A Chinese blue and white porcelain bowl, decorated to interior with flowers and foliage within a Greek key border, the exterior with stylised flowers, bears double blue circle to base.